Why should you go gluten free? The gluten free diet is a popular trend, but many people change their diet for a reason. Going gluten free offers more than a new way of eating. It offers the opportunity to experience life more fully. For people with a wheat allergy, celiac disease, or gluten intolerance, a gluten free diet can positively benefit their lives. Read the top 10 reasons to change your favorite bread recipes and birthday cakes. Go Gluten Free If You Have …..
1. Go gluten free if you have celiac disease. According to the National Institutes of Health, approximately 1 in every 100 people across the world have Celiac disease, also known as Celiac sprue. This is an autoimmune disorder where the intestines are damaged each time the person ingests any form of gluten. Even minor amounts of gluten can cause damage, even if the patient feels no ill effects. 2. Go gluten free if you have a wheat allergy. In the United States, wheat is one of the top 8 allergens. Gluten’s side effects include discomfort, indigestion, itching, and anaphylaxis. Warning: If you have a wheat allergy, seek medical attention for treatment. A severe reaction can be fatal. 3. Go gluten free if you have gluten sensitivity. This problem may include digestive symptoms that are similar to Celiac disease. However, gluten sensitivity is often diagnosed when patients have tested negative Celiac and for wheat allergy. 4. Go gluten free if you have irritable bowel syndrome (IBS). Millions of people suffer from IBS, but few want to talk about it. Honestly, it’s an embarrassing issue that can cause instantaneous bouts of diarrhea, constipation or bloating, as well as stomach pains and cramps. Patients live a very restricted lifestyle and many are uncomfortable leaving their house or safe areas, which are usually limited by whether or not they will be able to find a bathroom at a moment’s notice. 4. Go gluten free if you have migraine headaches. Interestingly, a gluten free diet seems to be associated with a reduced occurrence of migraines. According to a press release issued by the American Academy of Neurology in 2001, a study showed that a gluten free diet reduced the number of headaches in a small group of people. I have found that a wheat free diet significantly reduces my personal instances of migraines. 5. Go gluten free if you have chronic fatigue. It’s not surprising that chronic fatigue and exhaustion are issues associated with gluten intolerance. Severe stomach issues like diarrhea can cause dehydration. When you are dehydrated, your body is unlikely to properly absorb nutrients. 6. Go gluten free if you have acne and dermatitis. Some evidence suggests that skin problems including acne, eczema and psoriasis may start to heal when gluten or wheat is removed from the diet. Other issues include rashes around your hairline elbows and arms. These problems often pertain to those with Celiac disease or wheat allergy, but it’s something to consider when changing your diet. 7. Go gluten free if you have foggy-headedness. Almost everyone has experienced the brain fog that occurs after eating a meal that is heavy in carbohydrates. But for some people, gluten may be to blame. Many people feel a brain fog after eating gluten. I often have this issue when I eat wheat. 8. Go gluten free if you have addiction to carbs. The Food Addiction Institute has cited several studies that indicate that gluten can be addicting. According to these studies, when gluten is removed from the diet, the cravings return to normal levels. These studies indicate that this occurs in people with Celiac disease, but it may also occur in people who simply overeat. Carbs stimulate the pleasure centers in the brain and mimic the addictive properties of opiates. 9. Go gluten free if you have chronic inflammation. Gluten can cause chronic inflammation in your body. Chronic inflammation leads to a host of problems ranging from heart problems to allergies. 10. Go gluten free if you have depression. According to an article in Psychology Today, there seems to be a link between depression and Celiac disease. Again, this is not surprising. People who have issues with gluten often do not absorb vitamins properly. In particular, the article suggests that lower levels of zinc may play a role in depression. If you’re ready to go gluten free, there’s no time like the present. 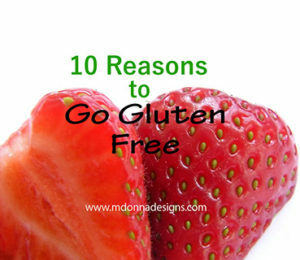 Going gluten free or switching to a wheat free diet is necessary if you are wheat-allergic or have Celiac disease. However, if you suspect that you have a gluten sensitivity, speak with your doctor. 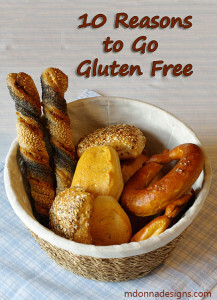 Meanwhile, read this article for tips on switching to a gluten free diet. « Frugal Homemade Cleaning – It’s Easy!